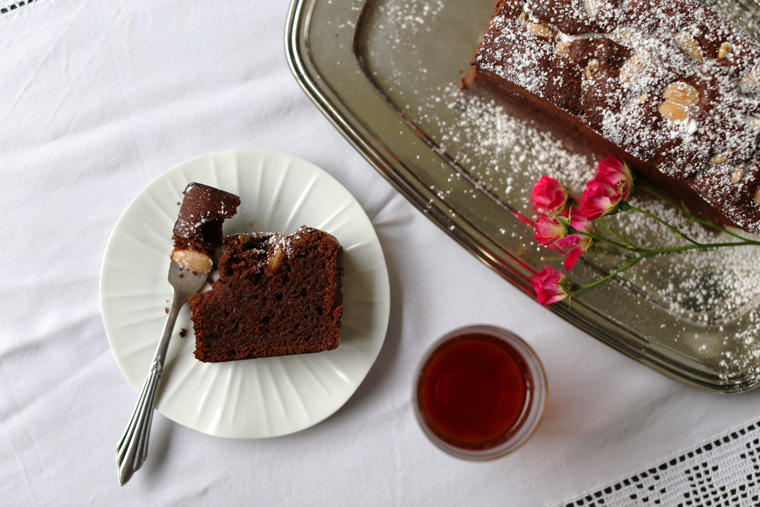 I have something to make your Monday better: a rich and fancy French chocolate cake that quickly and casually comes together in one bowl. 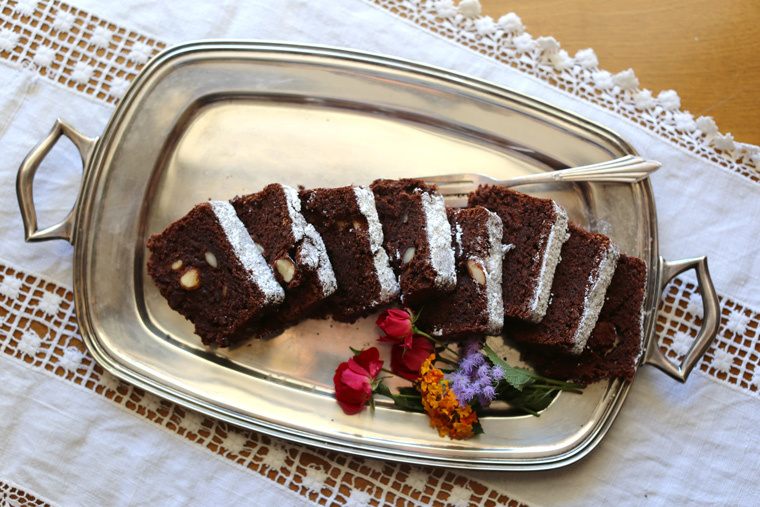 This is another one of my mother’s beloved recipes. We made this last weekend.. twice. The first cake was gone in a blink and I could hardly snap a photo. Not even a crumb was left behind. So we had to make it again and it was just as good the second time. 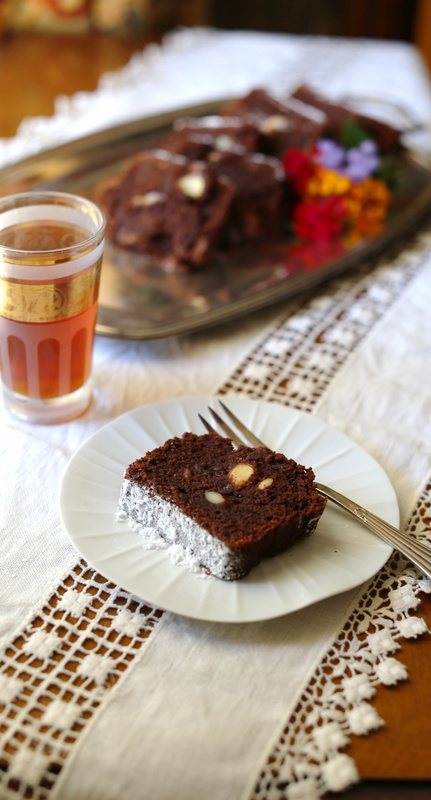 It’s fluffy and light and bursting with rich chocolate flavor. It’s so easy to make and you probably have all the ingredients on hand. It’s the perfect thing to whip up for an unexpected guest or bring to a holiday party. Enjoy! 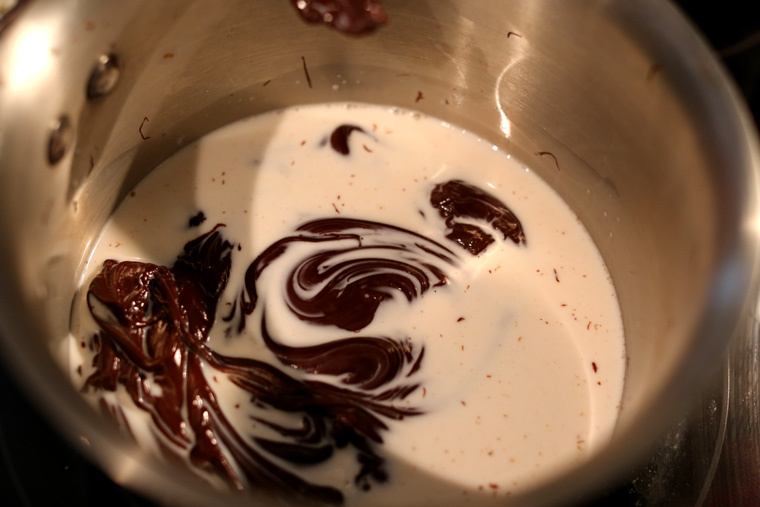 On the stovetop, heat the milk and the chocolate together so that the chocolate melts on medium / low heat. Next add the butter and let it melt completely. Then remove from heat. Now add the powdered sugar, flour and baking powder and vanilla (if using). Mix well, then add the egg yolks. After the batter has somewhat cooled, gently fold the egg whites under. Line a standard 9 inch loaf pan with parchment paper. 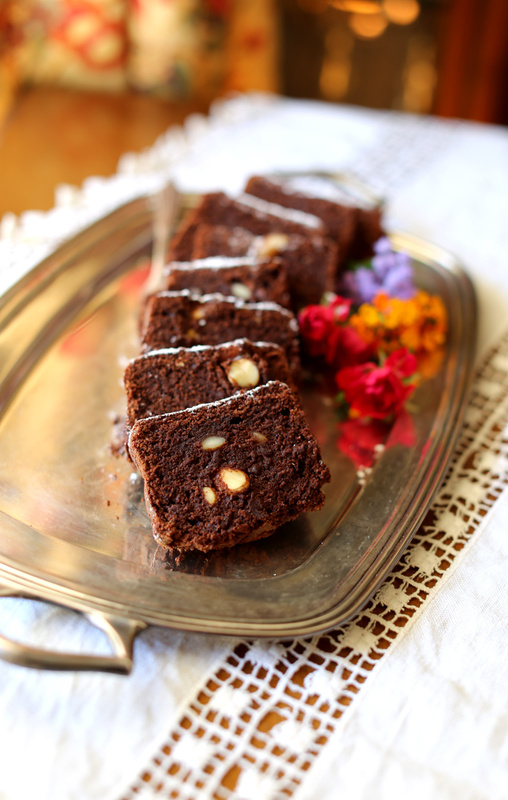 Pour in batter and mix in almonds. Bake at 350 F for 40 to 45 minutes in between middle and bottom rack. Let cool completely before transferring. 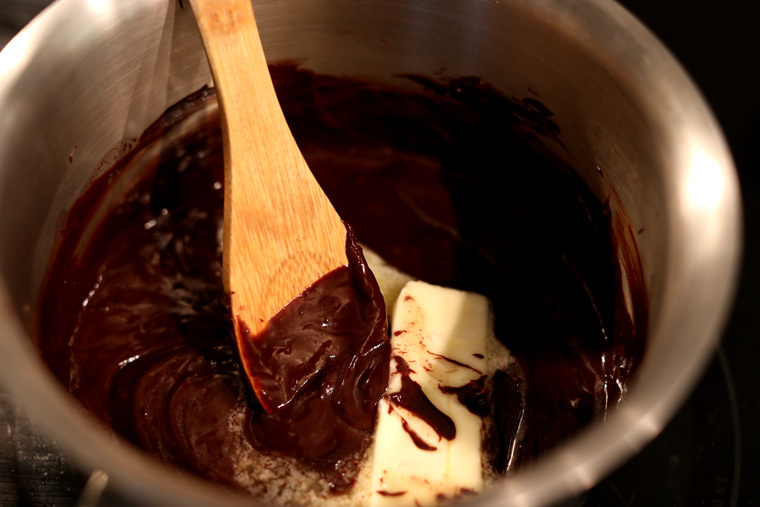 In a medium sized pot on the stovetop, heat the milk and the chocolate so that the chocolate melts on medium / low heat. Then add the butter and allow that to melt completely. Remove from heat and whisk in the flour, powdered sugar and baking powder and vanilla sugar/extract if using. 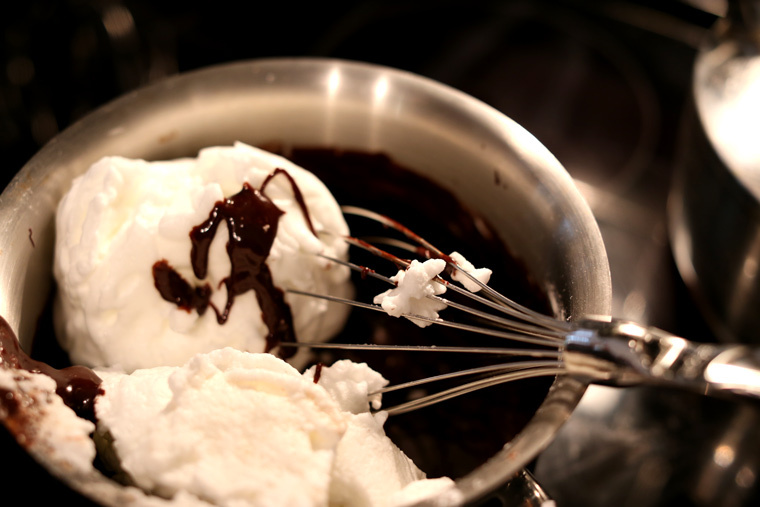 Let cool slightly while you whisk the egg whites to form peaks. 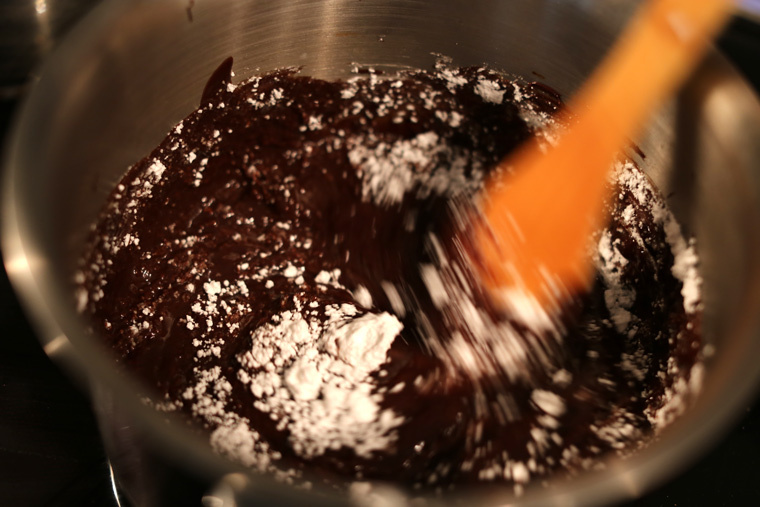 Mix the yolks into the chocolate batter, then gently fold in the egg whites. Line a standard 9 inch loaf pan with lightly buttered parchment paper. 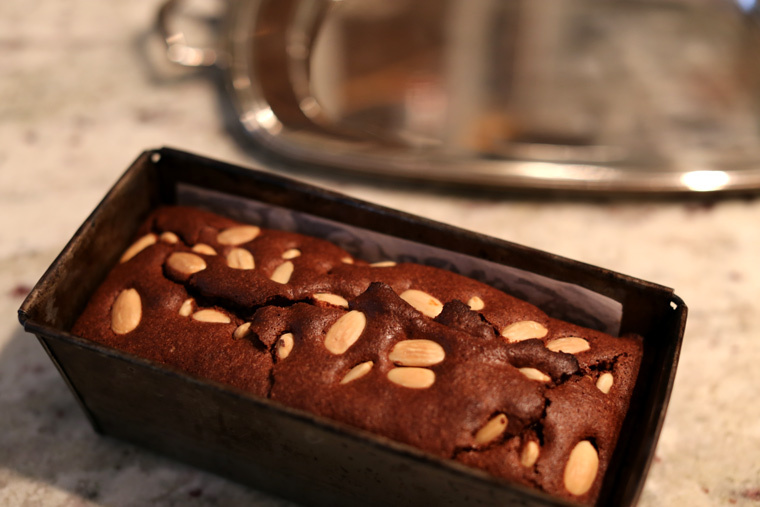 Pour batter into pan, top with almonds and bake in preheated oven on 350 F for 40 to 45 minutes. Let cool completely before you transfer to serving plate and dust with powdered sugar. I’m not sure why, but something about this pretty cake reminds me of the kind of thing you’d make at Christmas time. Looks so good! Thank you Marygrace! 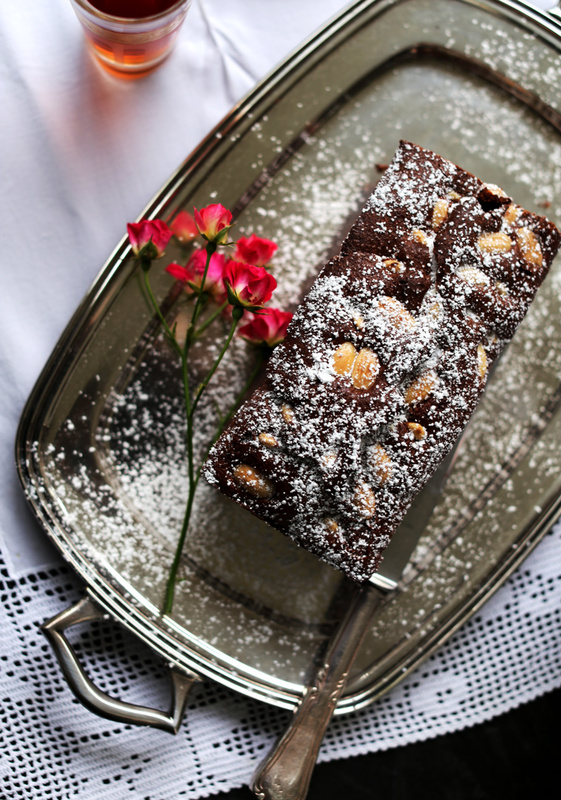 The best thing about chocolate cake is that you can eat it anytime of year – not just at Christmas time! Oh no! This is too beautiful. Looks like cake out of a Jane Austen novel. It’s so authentic. 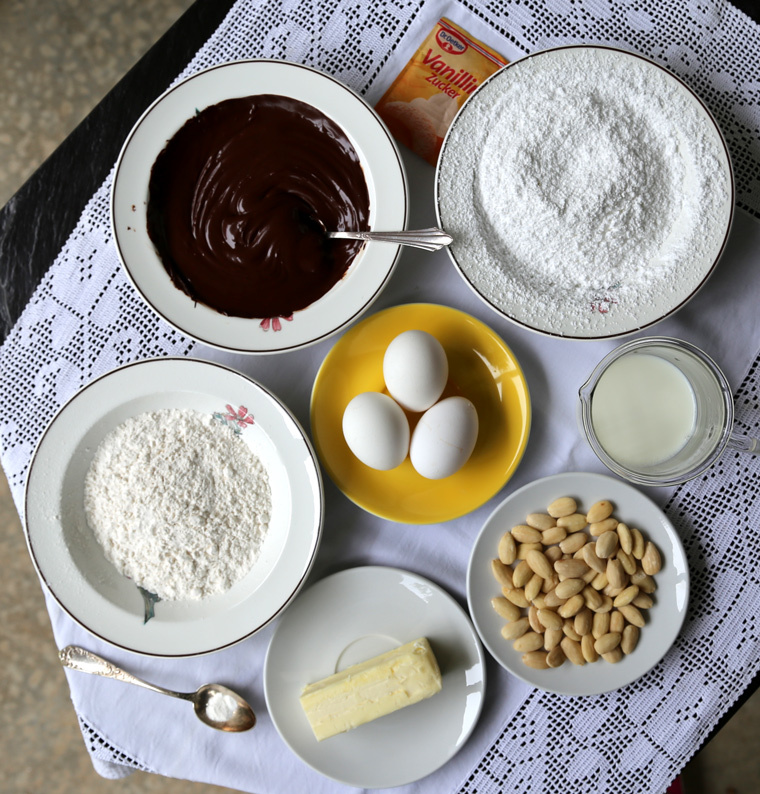 I always know I am going to like a new blog when I show up and the first recipe I see is made with chocolate! When do you add the vanilla sugar? Are you adding confectioners sugar or granulated white sugar? Thanks for your comment! You can add the vanilla when you add the confectioners sugar. I made a note of it above. Let me know how you like it! Thanks for responding so quickly. I think Iay try this with a touch of amaretto. Hi there, I’d love to make this recipe but could you give me the ingredients in grams? we don’t use cups in Europe and how on earth do you measure a tablespoon of butter??? Cake making is chemistry and needs to be precise or it won’t work. I find that even conversion tables vary!! It’s very confusing for us Brits!! Every time I try a recipe written in cups it NEVER works, although I do have measuring cups. And we would only use spoons for liquids – not butter, so I have no idea where to start. Thanks!